Point E is both the start and the finish. 167 miles; 3:34 on the road. Left at 11, got back at 11. 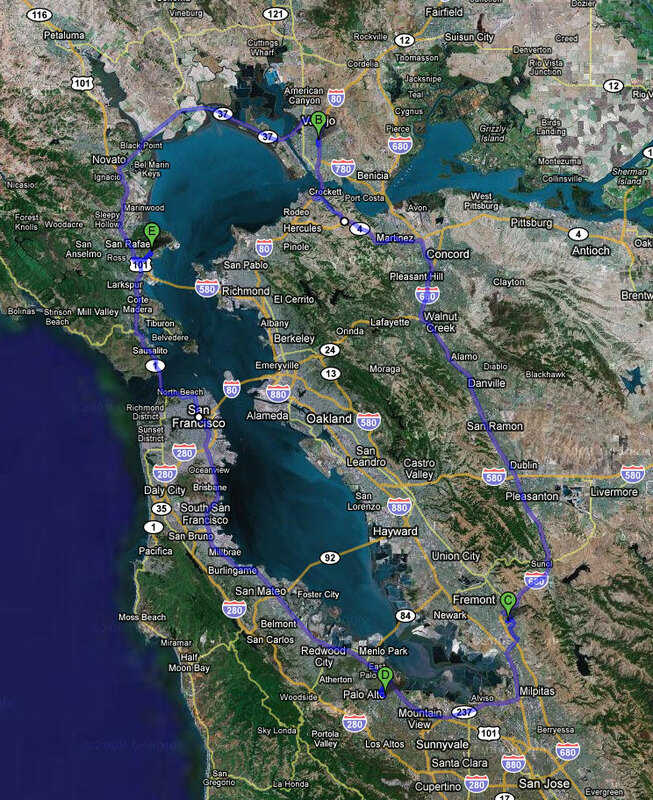 This is the first time I’ve made an entire loop around the Bay, I think. At least in one day. My dad and I were in some middle eastern country, and we had found our way into some large tent hut in the middle of a battleground. We decided we needed to defend ourselves, so we started looking for weapons. I found a bunch of cool knives in and around the tent. But when I re-entered the tent, I found that my dad (and someone else) had been taken hostage at the very back of the tent hut by a large woman with a gun. I grabbed a not-so-sharp knife and ran over there and tried to bargain. While doing so, I accidentally (?) stabbed the other hostage in the shoulder, to show that I was serious. The hostage looked at me, kind of annoyed. The large woman and I decided to slowly exchange weapons, so I took her gun, and she took my knife. It turns out that her gun was cheap plastic, and I couldn’t shoot her. She slowly stuck the knife into my neck and that’s about all I remember!